The Poor Knights are considered to be the top dive location of New Zealand. The Poor Knights are undoubtedly the jewel in the crown of New Zealand diving. A marine reserve since 1981 this subtropical reef system presents a stunning diversity of reef fish, pelagic, sponges, anemones, nudibranchs and sea weeds - so good that Jacques Cousteau rated the Poor Knights as one of the top 10 dive sites in the world. And more recently it was voted the best sub tropical diving in the World by Diver magazine (UK). The eroded remains of a group of volcanoes which erupted around 11 million years ago, the steep cliffs which fringe the islands plummet 100 meters below sea level in places, before reaching a sandy sea floor. The diving here is superb, with very good visibility up to 30 meters - rich marine life and photographic opportunities. The islands are bathed by a warm subtropical current and fish include tropical species such as spotted black groper, mosaic moray and Lord Howe coral fish, which are rarely found elsewhere in New Zealand waters. Reef fish at the Poor Knights include pink and blue maomao, and two-spot demoiselle, kingfish, koheru and trevally are common. 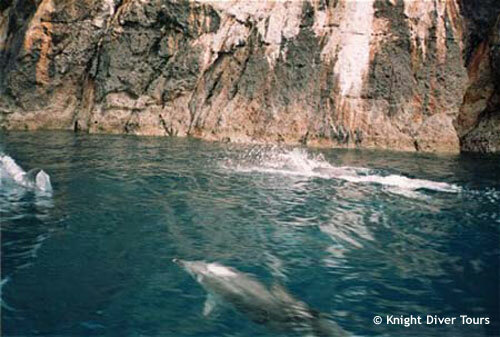 The Poor Knights can be dived all year round. The underwater visibility varies from between 15-30 meters throughout the year, although at times visibility exceeding 46 meters can be experienced, with the best visibility during the winter months of May to September. Water temperatures range from 19-25 degrees Celsius during the summer months to 14-17C during winter. Most divers use a 7mm wetsuit year round. For non divers there is also plenty to see and do. Boats are often escorted to the dive sites by dolphins or migrating whales on their journey to and from Hawaii, making an excellent trip for sightseers, kayakers and snorkelers. Kayaking from the dive boat, you can explore the caves, arches, and clear water of the Poor Knights, and snorkeling is an excellent way for non-divers to observe the unique marine life.